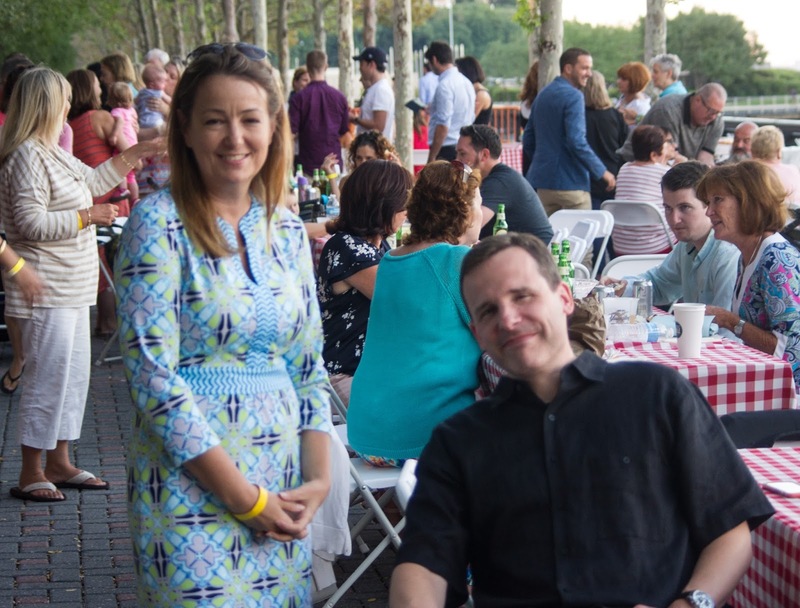 Last night's annual spaghetti dinner was picture perfect and that was before a bevy of Hoboken City Council candidates showed up making the rounds in the unofficial beauty contest before the official filing deadline Monday afternoon. First to make her announcement as a City Council candidate in the second ward, Tiffanie Fisher. In remarks at the dinner with MSV, she acknowledged she's submitting her petitions eager and willing to take on all comers. Fisher is the condo president of the Hudson Tea Building, a sleeping giant awakened in municipal elections. The building's residents are legally pitted with the City of Hoboken against the Barry family via their firm, Ironstate Development over the proposed Monarch Project towers. Another recent effort Fisher worked with local residents of note is a new stop sign at 15th street. Councilwoman Beth Mason attempted to take credit for the effort recently on her Facebook page. That was met with scorn by Hudson Tea Residents who acknowledged efforts of other officials at City Hall notably excluding the unpopular litigious councilwoman. Last summer Beth Mason crashed an annual gathering of Hudson Tea Building residents. They recalled her ignoring their warnings on the Monarch Project and had her thrown off the premises. That reportedly followed with the Hoboken Fire Department arriving shortly thereafter questioning the safety of the event. Hudson Tea residents believe it was Beth Mason who retaliated ratting them out in an attempt to break up their family friendly soiree. Mason has been viewed by many as backing the widely covered SLAPP-suit against the First Amendment rights of a dozen Hoboken residents she announced in a live City Council meeting in July 2012. That civil lawsuit brought by her long time political operatives was decimated by Hudson Superior Court last month as frivolous and slammed with over $275,000 in sanctions. Beth Mason has missed four consecutive City Council meetings and all but gone into hiding since Judge Patrick Arre issued the scathing decision last month. Yet another potential Second Ward council election development; three sources independently declared BoE Trustee Peter Biancamano will submit petitions and also challenge for the council seat. Biancamano did not attend the dinner as a Board of Education committee meeting was underway and he was not immediately available for comment. Tiffanie Fisher, the condo president of the Hudson Tea Building says she's officially a Hoboken City Council candidate for the second ward seat and has her petitions prepared for submission. Pictured at the annual spaghetti dinner here with second ward resident Franz Paetzold, Fisher's been very active in Hoboken issues offering a striking professional contrast to Old Guard incumbent Beth Mason. Talking Ed Note: Anticipated candidates for Hoboken's November City Council ward races were out in force with BoE candidates showing as well. First Ward Councilwoman Terry Castellano appeared as did her announced challenger Michael DeFusco. Councilman Michael Russo was in attendance with his family and is readying his re-election bid for the Third Ward. Rumors floated his potential challenger was out collecting petitions. Fourth ward saw new mom and Hoboken Housing Authority Chair Dana Wefer make an appearance with the current occupant of the seat Timmy Occhipinti out and about. Fifth ward was represented by both expected candidates. Two term Councilman Peter Cunningham had a table of supporters while his expected opponent Eduard Gonzalez also made the big end of summer dinner. Sixth ward Councilwoman Jen Giattino motored the length of the tables while her expected opponent, Carmelo Garcia also showed. The Board of Education was well represented with a number of current trustees. Incumbent for re-election Tom Kleupfel was spotted so too candidate Brittany Montgomery who ran for City Council in 2013. Da Horsey met BoE candidate Sheilah Dallara and her husband for the first time and they made the rounds chatting with a number of residents and reform activists. Perenial candidate Patty Waiters was spotted outside the gathering and is expected to again run for a BoE trustee seat.